I'm always trying to think of different things I can have for breakfast, as I try not to have cereal or toast for breakfast if I am having a sandwich for lunch (part of the idea of the Slimming World plan). So it also has to be something healthy, and preferably something that is quick to prepare and eat or that I can take to work and eat at my desk. I bought some peaches and had some raspberries left over from this recipe so decided to use them as the basis for a breakfast pot. First I poured a few spoonfuls of Special K into a dessert glass; you could also use muesli. Next add a couple of spoonfuls of fat free Greek style plain yogurt, and a little sweetener such as Splenda, or honey or agave nectar if you prefer. Swirl in some raspberries or raspberry puree. 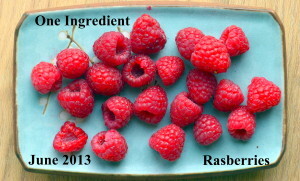 I preferred to whiz the raspberries in a blender to make into a puree which I then stirred through the yogurt. As my boyfriend has had a kidney stone I've been thinking about foods that are high in fibre. I previously bought a packet of hemp seeds from a health food store for a smoothie I made and had a lot left, so I sprinkled a teaspoonful on top of the peaches. I thought putting it on top would give a satisfying crunchy topping though you could also mix it in with the muesli layer. Here's a side view of the breakfast pot; I also made one in a plastic container to take to work and eat straight from the pot. It was delicious and really filling, I wasn't hungry again until lunchtime. I'm sending this to Breakfast Club, hosted this month by Elizabeth's Kitchen as the theme for June is high fibre. I'm looking forward to seeing what other ideas people come up with! The challenge was created by Helen of Fuss Free Flavours. This used up leftover fruit and cereal from a packet I already had open, so it was actually a quite thrifty breakfast. For that reason I'm sending it to Credit Crunch Munch, hosted by Helen at Fuss Free Flavours and Camilla at Fab Food 4 All. This month it is guest hosted by Anneli at Delicieux. Raspberries are the ingredient for this month's One Ingredient Challenge, hosted by Nazima at Franglais Kitchen and Laura at How To Cook Good Food. What a great idea! I'm looking for new breakfast ideas too that are not cereal or toast but quick and easy and this looks perfect. sounds good-very light and refreshing and tasty. lovely breakfast idea Caroline. I too try to make nice healthy breakfasts these days. I am making a lot of bircher muesli (soaking the porridge oats in a yoghurt/milk/fruit mix overnight) and it is incredibly good as I am usually feeling full well into the lunch hour. I shall try your idea out too as it looks delicious!